You want to buying bonsai trees online? That’s great, because it’s fast and convenient. 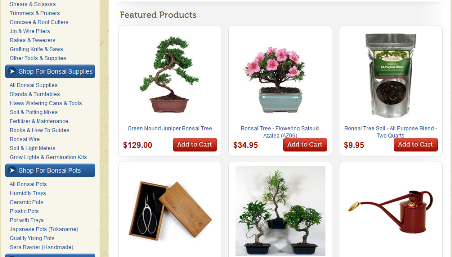 Like online shopping for other products, purchase of bonsai trees, tools, supplies and accessories, etc… becomes more and more popular in bonsai community, especially in developed nations like the US, Europe, and Japan. While there may be no such thing as the “best online bonsai stores”, there is no doubt that some are better than others. Some bonsai stores sell their own products, others only offer drop shipping services by selling someone else products and get commission. Some stores have their own nurseries to grow seedlings till mature age, others don’t. But one thing for sure… no matter which one you consider the best online stores, purchasing on internet is a remarkable way to help you collect bonsai items, enjoy a beautiful hobby, and nurture your graceful life. How do you buy bonsai trees online? That’s easy. Just go to Google or some other search engine and type in “bonsai stores”. You’ll get a ton of results. But before you do that, here are a few of my tips and pointers to stay safe while shopping online. As your expertise grows, you can try buying from smaller, specialty sites. But to start with, I’d recommend you stick with some of the better established online stores, such as: Bonsai Boy of New York; Eastern Leaf; Bonsai Outlet. Besides a reputation of online shops, other factors should be considered when you looking for buying bonsai trees online. Is it referred by anybody, say your fellow bonsai enthusiasts? Referral takes important role of an endorsement for the reputation of the store. If it is managed by a person who has successful tracked records in growing the bonsai trees. The website and store should be operated by an experienced bonsai expert, who understand needs of buyers and help them out when needed. If the website is registered with a regulatory authority. This applies in several countries e.g. the Better Business Bureau in the US and Canada. In other nations, you should find out whether online businesses need registration from any authority and go checking. Whether it receives good feedback from other clients. You can search on website to find out if there’s a page for customers’ testimonials. Good remarks and comments from previous buyers are important criterion showing the competence and service quality of the store. If it offers money-back guarantee for protecting your interest from various delivery issues. Though that sounds a little promising thing, but by that guarantee you can judge the commitment of a seller that you never meet. How is bonsai tree delivery? You should check whether ordered items will be delivered within estimated time-frame, say a week. Also, shipping cost sometimes is pretty much and you’d better find out who is responsible for it, you or the seller. Happy with your buying bonsai trees online? Have you ever bought bonsai trees online? Are you happy with the items you bought, and the delivery? Do you want to suggest a prestigious online bonsai store? Share with us your experience or suggestion here!